I am certain we’ve all heard of ginger beer and may have even tried it before, but, if you have not heard about or tried Farmer Willie’s Ginger Beer, well let me introduce you to it because it’s a ginger beer you should definitely get to know. Don’t worry, I am still the whiskeywench and although this product is not whisk(e)y, it is a product I absolutely had to write about so rest assure, I will incorporate some whisky talk at some point. Before being introduced to this ginger beer, I had never seen/tasted actual alcoholic ginger beer before and if you have, then let me tell you, you haven’t had one quite like this one. Farmer Willie’s ginger beer isn’t just your ordinary ginger beer, it is ginger beer taken to the absolute next level. It’s alcoholic ginger beer for crying out loud!! How did this concept get started? With a goat farmer and two Brown University students. 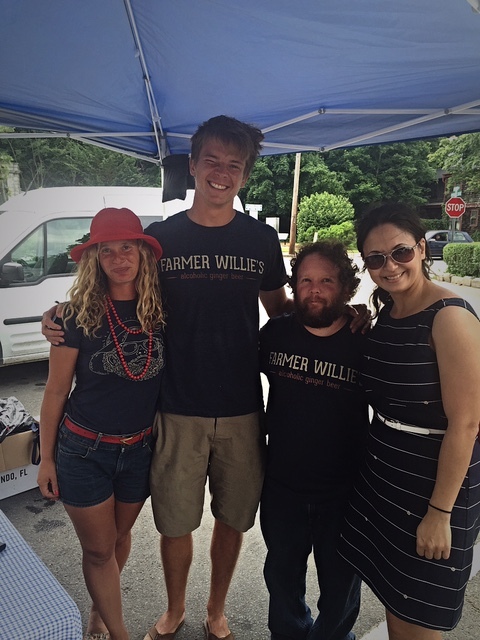 Willie Fenichel first brewed his now Farmer Willie’s Alcoholic Ginger Beer in 2008. Co-founder Nico Enriquez met Willie when he was 12 years old in Truro, MA. According to Enriquez he befriended the family and before long he was over almost every night eating their entire fridge. It was not till before heading off to Brown University that Enriquez finally got to taste this ginger beer and it was then that the idea was planted to bring this recipe to masses with the help of their second co-founder Max Easton, also a Brown University student. My boyfriend and I were introduced to this ginger beer when we spotted their stand at the local Farmer’s market during the 4th of July weekend in Provincetown, MA. Personally, I love ginger beer, especially in a dark and stormy, so the minute we saw the stand, we ran to it. Not only did we run to it once, but we also went back a second time to buy the actual product. There was no way we planned to head back to Boston without it. We not only bough some ginger beer, but we also got a chance to take a quick pic with the team. It is a start-up company and because of that, they have partnered with Downeast Cider to get this product out to the market. They are truly working hard, believe it or not according to Enriquez, they “hand grind 300 lbs. of ginger in dinky Cuisinart’s for each batch”. If that isn’t love and dedication, I don’t know what is. The taste of this ginger beer reminds me of cider, it’s light and goes down easy. You can drink this ginger beer alone or you can also mix it in a cocktail. 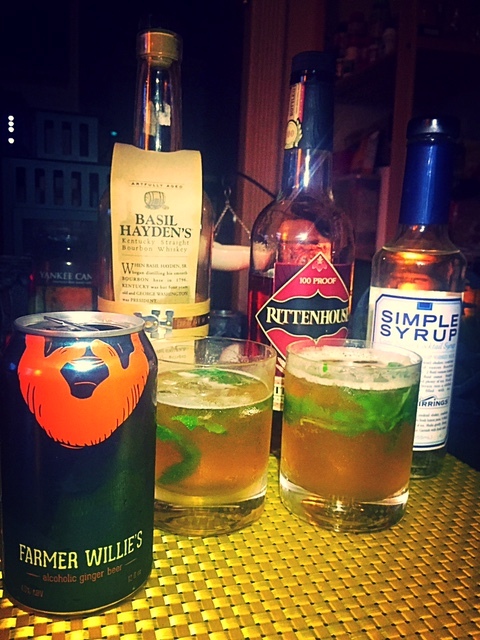 You can find great cocktail recipes on their website, but also, Nico was kind enough to partner with Danny, bartender from Jimmy’s Hideaway in the Provincetown to come up with a whiskey recipe for this blog and all our whiskey lovers. Here is what they sent. For this recipe muddle the mint together with the lime juice and simple syrup. Add ice, then the bourbon and shake that up. Finish it up with Farmer Willies Ginger Beer. I unfortunately didn’t have the ingredient needed at home to create Danny’s recipe so, I improvised using what I did have accessible. Here is what I came up with. *Note I made two cocktails one with Basil Hayden and one with Rittenhouse. They were both great, but there was a slight more sweetness to the cocktail I made using Basil Hayden. Yum! I muddled about 4 leaves of basil together with a splash of simple syrup and a splash of lime juice. In a shaker I mixed ice, whiskey (I took the cap of the shaker and poured the whiskey in there to the top. I did this twice). Then I added ginger beer and I poured about a 1/4 of the can (as you may know, the ginger beer is carbonated so be careful with the shaking). Pour all that in a glass after a quick shake, let it sit for about a minute or two, then enjoy. It was tasty, refreshing and my boyfriend love it. He thinks we should make pitchers of these and serve at a party. There is so much you can do with this ginger beer. It is truly fantastic and I highly recommend trying it and spreading the word.